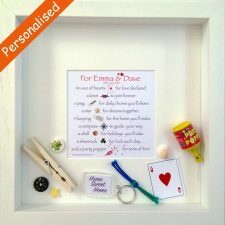 A sweet poem personalised with baby’s name and date of birth, to send good wishes to a very special baby. Personalised detail replaces the title line in the image shown. This lovely poem is also illustrated and has special items relating to the poem sitting in the bottom of the white box frame. 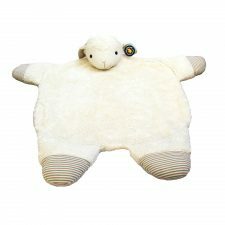 A unique New Baby Gift, which will compliment all styles/colours of nursery. 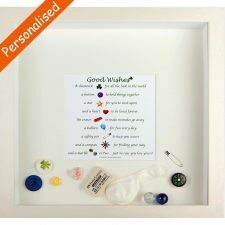 A lovely verse for a new baby in a box frame with loose items in the frame relating to the poem. 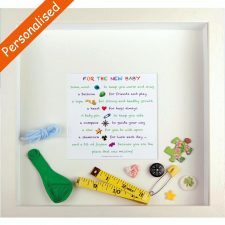 This lovely New Baby Gift is handmade in Ireland in a white wood frame and is presented boxed.